Heal Your Puzzle » Blog Archive » Wanting a Perfect Christmas? Anxious or Excited?.. Wanting a Perfect Christmas? Anxious or Excited?.. At the Thornbury Wellbeing Group last month, we enjoyed our traditional pre-Christmas discussion about ‘Angels’. Experiences were shared, questions asked and we also immersed ourselves in a couple of wonderfully relaxing and insightful meditations. One of the topics we discussed that has stayed with me, was about ‘Perfection’… what does that mean? Is it Healthy? Is it important? When you strive for a Personal Goal, is Perfection what you are trying to achieve? And is a ‘Driving Ambition for Perfection’ an unhealthy unhelpful Obsession?… Or a wonderful expression of who you are? The Festive Season seems to bring out this need to achieve Perfection… perfect presents for each of your friends and family, the Christmas Dinner, everything being picture-perfect… A time heaped with Tradition and memories of past experiences… and creating memories for the future 🙂 Does this drive for ‘Perfection’ bring you stress or happiness? PERFECTION is defined as “The action or process of improving something until it is faultless”… and “having all the required or desirable elements, qualities, or characteristics; as good as it is possible to be”… but who or what sets the rules? 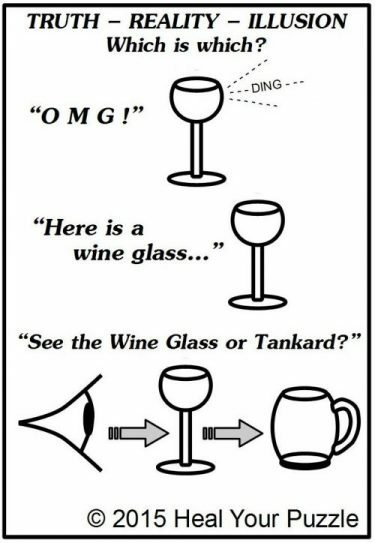 This reminded me about my discussion on ‘Truth‘ back in March 2015 (picture) when I likened it to that moment of clarity when you tap a quality crystal wine glass and the ‘ding’ has a quality beyond just the sound… it seems to light up everything with a feeling of Wonder and Beauty!! This Clarity, this Faultless sound… Perfect… but can anyone be Perfect? Is it Real?… Or an Illusion? We are all human, very few of us ‘ding’ and some of us are tankards or tumblers or teacups… does that make us imperfect? Or less beautiful? Or worthless? NEW Heal Your Puzzle Workshop and ‘Your Healing Space‘ Group starting January 2018….